Handkäse is a regional sour milk cheese which gets its name from the traditional way of producing it. Handkäse is formed with hands. The tourists always ask about the “Musik”. The Frankfurters would say “Musik kommt später” – “Music comes later”. But what do they actually mean? They mean flatulence caused by onions:) This information shouldn’t keep you away from this amazing starter, because it isn’t true. Or, it is, but that is not the real reason why they call it Hand Cheese with Music. The real reason is that previously the onion sauce was served on the side and vinegar and oil was served in small jars that made music while being carried on a plate. I have first tried the Handkäse mit Musik in a very traditional restaurant in Sachsenhausen. There are different ways of marinating it, my favourite one says that the cheese should be marinated from the very beginning with onions. The marinade gives an amazing flavour not only the onions but also the Handkäse. The cheese has a lot of proteins and no carbs, therefore it’s a perfect choice in the restaurant when being on diet. While preparing this recipe it is mandatory to take the good quality cheese. 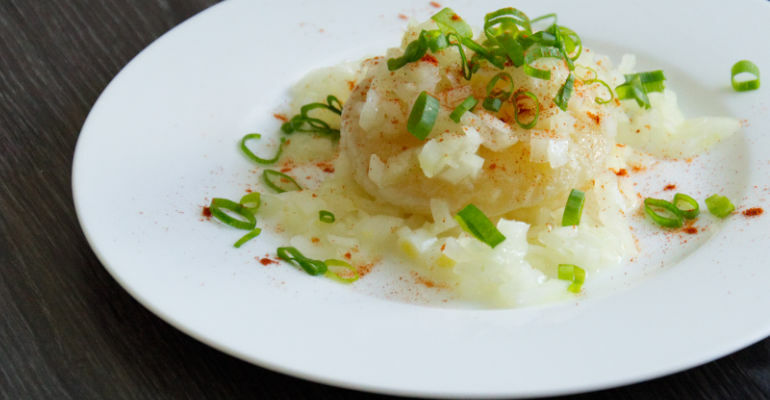 If you don’t have the possibility to get good Handkäse there is no way you will enjoy this dish. In this case, I would rather go to Frankfurt and try it/buy it there. Frankfurt is a nice city, so it might be worth the trip! Mix all ingredients in one bowl and leave overnight. Serve with caraway seeds and bread. Going to Frankfurt, Germany? Check out this video in which we show all the traditional food and drinks from Frankfurt that you can enjoy back home with your families and friends!